Yacht handicapping fees will rise by 12.5% for the coming season. The Irish Sailing Association (ISA) is the administrator for both the local ECHO and international IRC handicap systems. IRC certs are processed for the ISA by the London based Royal Ocean Racing Club (RORC) who govern the IRC rule. Ireland has a national cruiser racer fleet estimated between 500–700 boats. Meanwhile, handicaps will be a focus at the 2016 ICRA conference when it gets underway at the Castletroy Hotel in Lmerick on Saturday, March 5th. The pow–wow will receive a presentation from the promoters of the ORC handicapping system that is gaining popularity as an alternative to IRC. Florida's recent Key West Regatta in Florida was split between the two systems. Speaking to the Irish Times last Friday, former ICRA commodore Norbert Reilly said: “We have no idea what ORC is but would like to know and especially why it is making so much progress overseas. ICRA also plan a review of the ECHO system for 2016. The IRC rating rule has been used by racing owners in Asia for many years, with major IRC regattas well established in Hong Kong, Thailand, Malaysia and Singapore. In the last few years Japan and mainland China have benefited from the use of IRC for their racing fleets, and now the RORC Rating Office and the Chinese Taipei Sailing Association (CTSA) are pleased to announce that IRC will be used for Taiwan-owned boats in 2016, further strengthening the IRC fleet in East Asia. The local yachting scene in Taiwan has recently been boosted by the relaxation of harbour entry and tax rules, in an effort to help develop the domestic market in leisure yacht ownership as well as attracting visiting yachts. Against this positive background the CTSA, as the World Sailing Member National Authority for the country, is enthusiastic in its responsibility to organise and encourage fair yacht racing for their sailors and recognises the IRC rating system as a superior method of handicapping its local fleet. The CTSA plans to hold IRC racing at the Penghu International Regatta Series this summer and looks forward to introducing IRC rating to boat owners in Taiwan. Taiwan lies around 180km east of China, so using the IRC rating rule will allow Taiwanese owners to race not only in their local waters but also in events organized by neighbouring China and Hong Kong, and indeed any other IRC race worldwide. Visiting sailors who hold IRC ratings will also be able to join in with races in Taiwan and have the opportunity to race in a different mixed fleet and boost local entries. IRC is one of only two International Rating Rules as recognised by World Sailing, and annually issues 8000 certificates to 6000 boats racing in hundreds of club and international events in almost 40 countries worldwide. In all but one of the famous offshore classic races, including the Rolex Fastnet Race, the Rolex Sydney Hobart Yacht Race and Rolex Middle Sea Race, the major trophy is awarded to the overall winner in IRC. The first ever IRC European Championship will take place during Volvo Cork Week, 10-15th July 2016, Royal Cork Yacht Club has announced. The new event in the RORC Calendar will be hosted by the Crosshaven club, in the sailing grounds of Cork Harbour and the Atlantic Approaches. The first edition of the RORC IRC National Championship took place in 2000, and has done so every year since. There are now seven IRC National Championships throughout the world, but up until now, there has been no continental event. "Royal Cork Yacht Club is honoured to be chosen to host the prestigious Royal Ocean Racing Club's inaugural IRC European Championships, during Volvo Cork Week 2016. This is a great honour for Irish sailing, and the fact that Ireland has been selected as the host nation for the first ever IRC European Championship, will guarantee support from IRC boats from all over Ireland as well as overseas.” commented Kieran O Connell, Chairman of Volvo Cork Week. “It is also a great reflection on the Race Management here at Volvo Cork Week, and shows the confidence that RORC have in The Royal Cork Yacht Club’s ability to manage an event of this scale. On the racing front, Volvo Cork Week 2016 will not disappoint, with plans already well underway to host a championship that will both meet and surpass the requirements of this unique world class event both on and off the water. We welcome all in advance”. Racing short handed means you are utterly dependent on your partner, their skills and input both tactical and navigational, as well as the sail handling. The boat needs to be prepared differently, simplify everything, so there was no umming and arring about sail calls, we just use what we have got, remembering that not having an extra 450 kilos of crew weight on the rail meant that the boat was tuned differently so that we could de-power much earlier than usual to keep the boat on it's feet and footing rather than crabbing sideways. Congratulations to Paul Dunstan and crew Tony Wrath, winners of Race One and runners up in Race Two, winning their class for the IRC Double Handed National Championship, racing Folkboat, Mandarin. Chris Charlesworth's Contessa 26 Meow, crewed by Martin Young, scored a third and a bullet to finish runner up by just a point. Dave Wright's H-Boat, Hubble Bubble crewed by Luke Bradley was third just a point ahead of David & Peter Cowell's Hanse 291, Seahorse. Northern Ireland's Solitaire du Figaro sailor, Andrew Baker, will be racing with Solo Round the World Sailor, Mike Golding in RORC's second edition of the IRC Double Handed National Championship will take place in the Solent, this weekend. A huge variety of keelboats have entered with about 40 teams taking part. Three races are scheduled with no discard. The variety of courses are designed to test all the elements of Double Handed racing with a laid marks course, a round the cans race and a long passage race. Artemis Ocean Racing have entered four double handed teams racing Figaro II skippered by talented young aspiring short handed sailors. RYA Match racer and 49er FX sailor Mary Rook. Will Harris, University Student and past Laser 4.7 National Champion. Hugh Brayshaw, Silver medallist at the 470 Junior European Championship. Andrew Baker, Solitaire du Figaro sailor, will be racing with Solo Round the world sailor, Mike Golding. #rorc – RORC has published a list of GBR IRC Championships for the coming season. There are plenty of opportunities for boats and their owners to become Spinlock IRC champions around the country this summer, says Jenny Howells, Technical Manager of the RORC Rating Office in Lymington. "Now in its 6th year, the GBR IRC Championship circuit has a variety of events to offer IRC racers, from the Small Boat Championship in the Solent to Regional Championships in six different areas, and of course the National Championship organised by RORC itself." More details of the events and organising clubs can be found on www.rorcrating.com in the Spinlock IRC section. The Championships are approved to accept Spinlock IRC Single Event Ratings, so even if you are not a regular IRC racer you can compete in two events per year at a minimal rating fee. #welshIRC – Did you know there was a catchy named 'RORC North Western IRC Regional Championships' submerged beneath 'Abersoch Keelboat Week'? As one Irish interloper explained it's been some years since a week swinging on a mooring was de rigueur and Keelboat Week attracted much beyond local interest. Down the road at Pwllheli they have a well serviced marina, a national events centre with grand plans for expansion and a Celtic Regatta that has also recently become of little more than local interest. Put the cruiser/racer event and the cruiser/racer friendly venue together and north Wales finally has the beginnings of a big boat event worth travelling for. For 2014 the rebadged Spinlock Welsh IRC Championships, with the support of ISORA and ICRA, drew interest from the north west of England, Scotland and Dublin and a competitive 40 boat fleet. If competing interests can be navigated and a stable date found in the Celtic sailing calendar, add a patch of water whose simple (although not quite as minimal as the locals would like you to believe) tide and wind patterns offer a different challenge to anything found in the major sailing centres of Ireland or west of Scotland and the south coast of the Llyn peninsular may have the ingredients for a top class championships. Confounding the measly forecast 2 races where sailed in 18 – 22 knots on the Friday. Royal Irish quarter tonner Cri Cri, skippered by Paul Colton, made a commanding start with a first in both races in Class 1, while the Sigma 33 Legless Again took 2nd and 3rd to take 2nd spot at the end of day 1. In Class 0, it was evident that Corby 36 Stratisfear, Corby 33 Imposter and Roxstar were serious contenders for the top spot with the Stratisfear taking a 2nd and 1st, Imposter taking 1st and 3rd and Roxstar 3rd and 2nd. Overnight the fleet made welcome use of the brand new visitor and events pontoons at Pwllheli. These pontoons are part of the £8.3m investment from the European Regional Development Fund through the Welsh Government and Gwynedd Council in the new Welsh National Sailing Academy and Events Centre that will open its doors in 2015. 2 cranes are to be added by the time next years event gets under way making attending the event even easier. After a further 4 races on Saturday Stratisfear's consistent performance put them firmly in the lead adding a 3rd and another first to two wins from the morning. Roxstar followed close on their heels. In class 1 Molissa and She Too all ended the day in contention. Eazi Tiger's consistent performance had them in 3rd place overall, a broken life line in race 3 slipped CriCri, into 2nd place and, after some highly consistent sailing, the J97 Injenious moored for the day in first place overall. With winds over 30 knots on Sunday racing for class 1 was abandoned. In class 0 local J109s Mojito and Sgrech got the best starts on the 24nm course and were off across the bay towards the St. Tudwal islands before some others had started as some were struggling to get sails up in the conditions. Round the islands and through some challenging seas, Imposter took the lead and line honours with Mojito 2nd and Gringo (National Yacht Club skippered by Tony Fox) third on the water. #icra – Support provided by Irish racers from ISORA and ICRA contributed to the success of last week's inaugural Welsh IRC championships. Forecasts for Pwllheli on the weekend of the inaugural Spinlock IRC Championships were predicting very light winds and many of the competitors wondered whether the full complement of races would be achieved. When the competitors emerged from the skippers' briefing they were greeted by winds of around 18 - 22 knots indicating that some good racing was on the cards for the Friday afternoon. The Royal Dee Yacht Club Race Committee, lead by Mike Butterfield, ran two races on the first day with Cri Cri, Royal Irish Yacht Club skippered by Paul Colton, making a commanding start with a first in both races in Class 1, while Legless Again took 2nd and 3rd to take 2nd spot at the end of day 1. In Class 0, it was evident that Stratisfear, Imposter and Roxstar were serious contenders for the top spot with Stratisfear taking a 2nd and 1st, Imposter taking 1st and 3rd and Roxstar 3rd and 2nd. Overnight the fleets were moored for the first time on the new visitor and events pontoons at Pwllheli. These pontoons are part of the £8.3m investment from the European Regional Development Fund through the Welsh Government and Gwynedd Council in the new Welsh National Sailing Academy and Events Centre that will open its doors in 2015. Friday night provided some legendary hospitality from Pwllheli with the Crews' dinner and a few beers. Saturday started very wet and the wind again defied the forecasters by providing speeds in the high teens. The rain cleared in time for racing and, as it looked like it was going to be another good day on the water, the race committee capitalised by running four races. At the end of day two Stratisfear's consistent performance put them firmly in the lead adding a 3rd and another first to their morning results with Roxstar close on their heels. In class 1, it was still all to play for with Molissa, Injenious, CriCri, and She Too in contention. However, Eazi Tiger's consistent performance had them in 3rd place overall with CriCri, who couldn't maintain Friday's excellent performance, slipping into 2nd place overall. After some consistent racing Injenious moored for the day in first place overall. Sunday presented the fleets with higher winds for their coastal race with speeds of 27 knots being experienced in the shelter of the marina. Once out on the water, winds in excess of 30 knots were recorded and with wind over tide, boats were met by choppy seas in the bay. Many boats decided that the conditions were too much for them and didn't turn up to the start, including Roxstar and Stratisfear who realised that they had enough results to discard the last race and still win overall. The race committee, having to endure those conditions themselves, decided that the smaller fleet, those boats with IRC handicaps less than 1.000, would not race and class 1 racing was abandoned. Local J109s Mojito and Sgrech got the best starts on the 24nm course and were off across the bay towards the St. Tudwal islands before some others had started as some were struggling to get sails up in the conditions. Round the islands and through some challenging seas, Imposter took the lead and line honours with Mojito 2nd and Gringo (National Yacht Club skippered by Tony Fox) 3rd, but after handicaps were applied Mojito took first place, Imposter 2nd and Gringo took 3rd. Guy Cowper, the skipper of winning boat Stratisfear, was delighted with the excellent sailing that was had by all at the Spinlock IRC Welsh Championships. 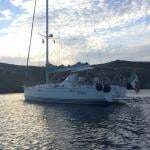 He said: "This is the best bay I've ever sailed in; there's no tide, no commercial traffic and the scenery is second to none. Add to that the positive attitude of the Club's staff and volunteers and it would be difficult to have anything but a great event here. When the new Welsh National Sailing Academy building is opened next year this will be a World Class venue. 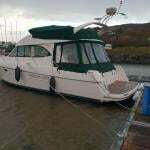 I cannot wait to return to sail in Pwllheli." The overall champion for both the Irish Crusing Racing Association (ICRA) and the Welsh Championship will be announced shortly. The events team at Plas Heli and Pwllheli Sailing Club are currently consulting competitors regarding the format and timing of the 2015 championships which will be hosted in the new Academy facilities. PSC Commodore Stephen Tudor said: "The Club was very proud to be offered the opportunity to host the first Welsh Spinlock IRC Championships and we are delighted that so many competitors from Ireland, Isle of Man, Scotland and Liverpool enjoyed their time in Pwllheli both on the water and ashore. The association ISORA and ICRA has strengthened the already established cross-channel link and hopefully this will continue to flourish and grow."